New Delhi Sep 15 (IANS) Prime Minister Narendra Modi on Saturday paid his tribute to Bharat Ratna M. Visvesvaraya on his birth anniversary and greeted the nation on the occasion of Engineers Day saying that their role in nation building was extremely vital. "On Engineers Day I congratulate our hardworking engineers and appreciate their dexterity as well as dedication. Their role in nation building is extremely vital. 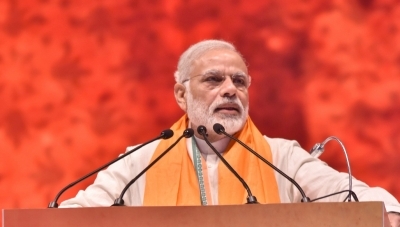 "I also pay tributes to the noted engineer M. Visvesvaraya on his birth anniversary " Modi said in a tweet attaching the video of his recent monthly radio broadcast "Mann Ki Baat". In his radio broadcast message on August 26 Modi had said that there were several engineers in the country who made "the unimaginable possible" and "presented such marvels of engineering before the world". "In this lineage of great engineers we were blessed with a diamond whose work is still a source of wonder for all. He was Bharat Ratna M. Visvesvaraya. Lakhs of farmers and common people continue to benefit from the Krishna Raj Sagar Dam built by him. "In his memory September 15 is observed as Engineers Day. Following his footsteps our engineers have created their own identity in the world " the Prime Minister had said.